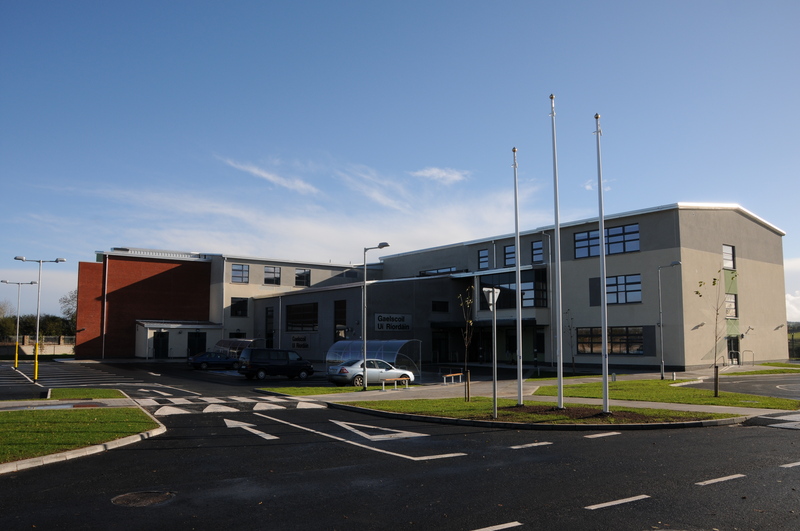 Gaelscoil Uí Ríordáin moved into their fantastic new school in October 2012, and over the last few months, have taken possession of the new building bringing with them their vibrancy, personality, emotions, originality of thought, hopes and dreams so that it it has truly become a community.Is nuair a ghlacann an pobal scoile seilbh ar an bhfoirgneamh scoile nua go mbíonn atmasféar, beocht agus anam le braistint ann. Tugann an pobal scoile leis fuinneamh, dóchas, úr-smaointe, aislingí agus croí isteach san fhoirgneamh folamh seo. These attributes will be reflected in the Per cent for Art Scheme so that the commissioned work will explore and commemorate this pivotal moment in the history of Gaelscoil Uí Ríordáin. Tríd an obair Ealaíne áirithe seo táthar ag súil go ndéanfar comóradh ar an dtréimhse cinniúnach seo i stair na scoile..
Bhi an sean-scoil lonnaithe ar láthair sealdach ar bhóthar Inniscarra, gar do Pháirc Réigiúnach Bhaile an Chollaigh le nach mór tríocha bliain anuas.Bhog gach duine isteach sa scoil álainn nua tógtha I Mí Dheireadh Fomhair 2012. I nGaelscoil Bhaile an Chollaigh cuirtear béim ar mheas a léiriú ar a chéile idir óg agus aosta agus tá caidreamh faoi leith idir na múinteoirí agus na paistí, úsáideann said ainm Baiste a chéile idir pháistí agus múinteoirí mar shampla. Bíonn na páistí croí-lárnach ins na h-imeachtaí scoile go léir agus déantar difríochtaí aonair a cheiliúradh. Déantar suíomh taitneamhach a chruthú do na scoláirí ionas go mbainfidh siad sult, spórt agus tairbhe as na laethanta a chaitheann siad ar scoil. Déantar dian-dícheall i gcónaí ardmheas ar an nGaeilge a chothú i measc pobal na scoile agus sa cheanntar máguaird. Tá áthas, spraoi, fuinneamh, fáilte, óige agus sonas go smior i saol na Gaelscoile agus beidh na gnéithe sin de shaol na scoile á leiriú tríd an tionscnamh seo. Ní mór an dlúthcheangal atá ag pobal na scoile lenár dteanga dúchais a chur in iúl chomh maith. We are delighted to welcome Fiona Coffey and Liz McMahon of Glendarragh Studios, Co. Wicklow to Gaelscoil Uí Ríordáin to challenge, create and delight the pupils, staff and parents with their commission in our new school. Cuirimid go léir fíor-failte roimh Fiona agus Liz agus tá súil againn go mbainfidh siad lán-taitneamh as a gcuid ama in ár dteannta. Taimid cinnte go mbainfidh an Pobal scoile tairbhe agus taitneamh as leis. Over the next few months, the artists will be in residence in the school to work with the pupils to create their pieces based on the theme of the River Lee – different classes and age groups will be working on different aspects of the theme. Handmade ceramic tiles will wind through the main entrance, main corridor, around notice boards & doorways, corridors etc at child level. Déanfaidh na páistí tíleanna, a bheidh greamaithe go buan ar fallaí na scoile. ‘Abhainn na Laoi’ a bheidh mar théama oibre acu agus na ranganna éagsúla ag obair ar ghneithe éagsúla den abhainn; stair áitiúil, éanlaith, éisc, ainmhithe, plandaí, finscéalta…………alán le foghlaim ar andturas seo!